Unhampered working time is one of the so many distinctive features of iPhone and iPad but their batteries are not immortal. After some time they are bound to be replaced because they lose their capacity. The battery is continuously monitored by the iOS operating system that enables the owner to have a check on battery wear level on iPhone and tablets and they can easily replace it whenever it is needed. Almost all modern batteries have the shortcoming of limited numbers of full discharging cycles. After all these cycles the declared capacity of the batteries starts dwindling, When the battery is discharged gradually from full to nil it is said be as completing its discharging cycle. The immortal battery of iPhone behave in the similar manner of all other batteries. Apple Watch and iPad lose 20% of the capacity after 1000 full discharging cycles, iPod loses 20% capacity after 400 cycles and iPhone battery loses up to 20% after 500 full discharging cycles. Many applications are developed by third-party to keep check battery wear level on iPhone such as Battery Life. 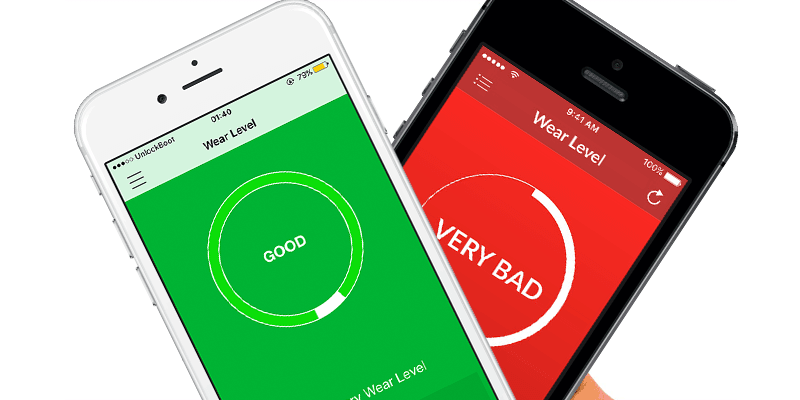 This third party application keeps check on the battery wear level on iPhone, tablets and iPads and rate the capacity as perfect, Good, Bad and Very Bad. The number of charging cycles can also be traced down with the help of Wear Level in the main menu where line cycles will lead you towards the charging cycles. 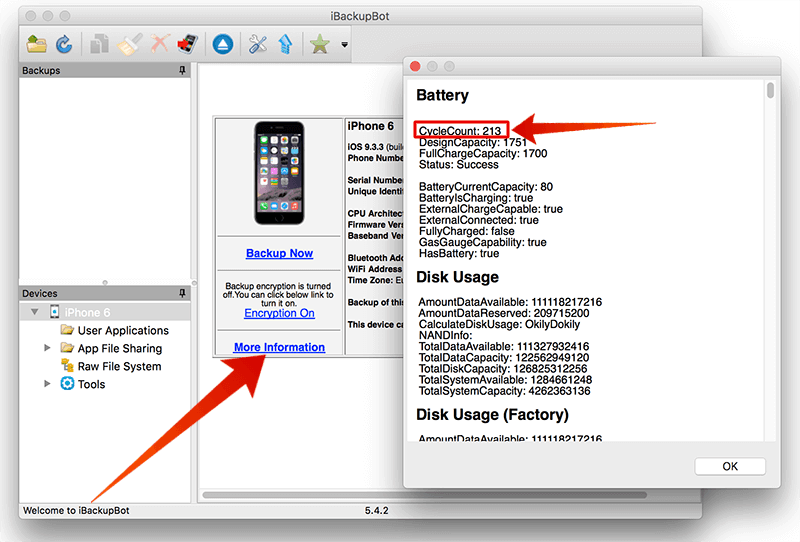 To check battery wear level on iPhone, iBackupbot desktop application can be used. When the iPhone is connected to PC, this application can be launched after this the gadget is selected from the Devices section. From there, click More Information from technical data, from there the charging cycles of battery (known as CycleCount) can be easily viewed. 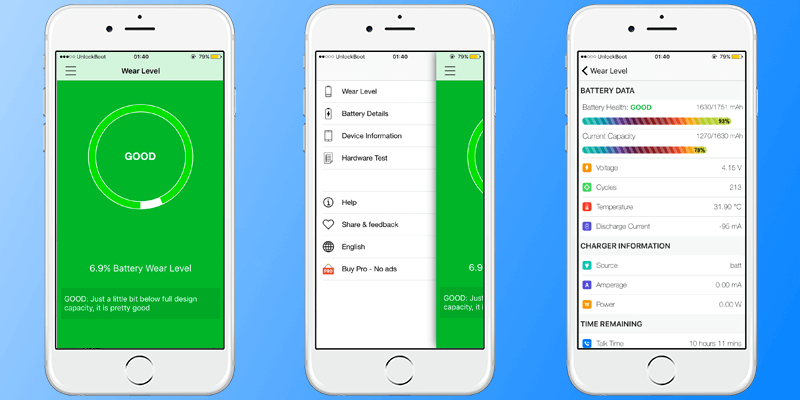 Update #1: Here’s a free app for Mac OS that can be used to check iPhone battery cycles. Follow our dedicated guide on how to do that. The recommended charge is 40% to 80%, not 100%, because the latter decreases the operating life of the battery. Batteries can easily wear out if frequently charged however full charge can be performed once a month.